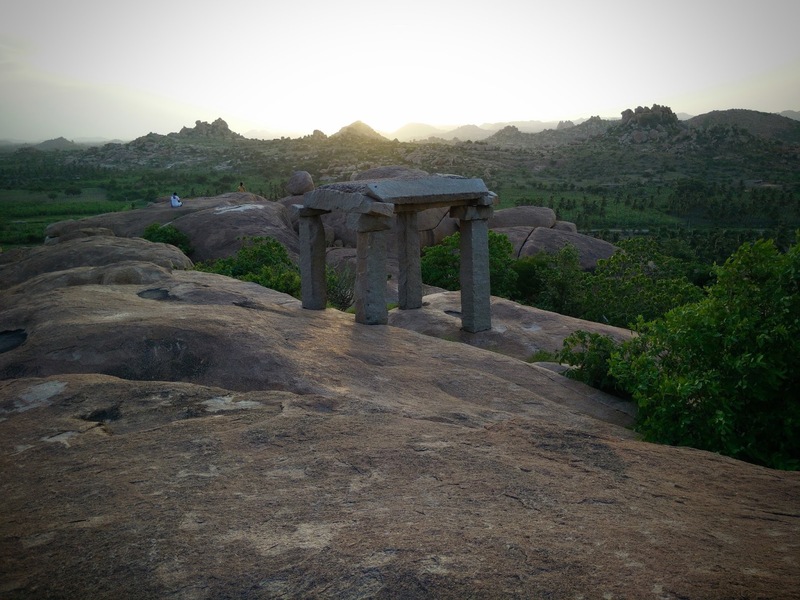 I knew of all the buzz around Hampi- its backpacker ghettos, chilled out cafés, laid back vibe and more importantly its history, archeological sites and landscape. Not being a huge fan of archeology and vast hot arid lands, I kept away from it all these years. But, a week back I found myself in midst of it, and just the way I would like it, in off-season ! A very dear friend of mine, living in Bangalore, decided to quit her job after 9 years. And I decided that it called for a celebration. Cosmos also chipped in and decided to throw in very cheap monsoon sale air-tickets and I was all set ! Hampi was indeed very gorgeous and all the buzz around it, is perhaps true. Vast boulder strewn landscape with pockets of sleepy hamlets around, make it very unique place to be in. I have to admit, I was quite awe-struck by the landscape and the new sense of space. While archaeological sites are the main draw of Hampi, I wanted to explore it my way. The slow and easy-going way, where I could get a whiff of local life, away from tourist hotspots. 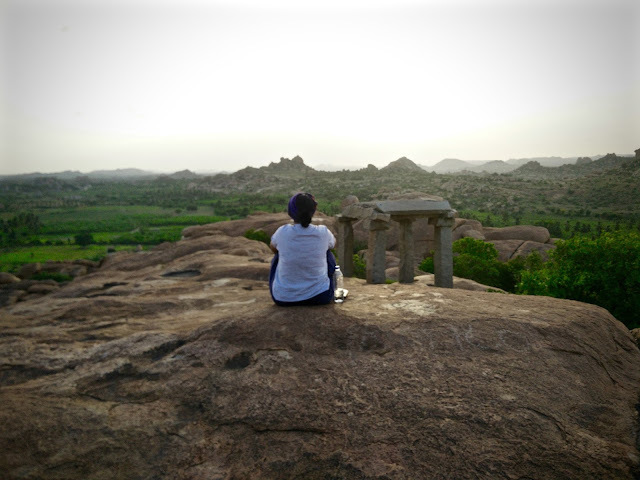 Here are some of my offbeat experiences in Hampi. Cross the Tungabhadra river at Talwarkatta boat crossing (near Vittala temple complex in Hampi) and you land in Anegundi. A beautiful village with a rich character of it’s own. A good half day can be spent walking through its by-lanes and watching life as it goes by. We came across lots of giggly school kids interested in polishing their English language skills, older women folk playing games on roughly drawn boxes on the ground and using small stones for dice, toddlers sleeping in hammocks made out of sarees hung from trees, a chariot kept right in the middle of village square with chillies getting dried around it and several heritage homes. Leave behind the cafés of hippie island with pseudo-psychedelic artworks on walls, to enjoy the hospitality of a local home. A typical meal would consist of several traditional veg and non-veg dishes served alongside jowar-chapati, rice, papad, spicy peanut chutney and a sweet. The cuisine here, as the rest of Karnataka, is heavily influenced from its surrounding regions of Andhra Pradesh, Tamil Nadu and Kerala. It’s high on spice as well as taste. 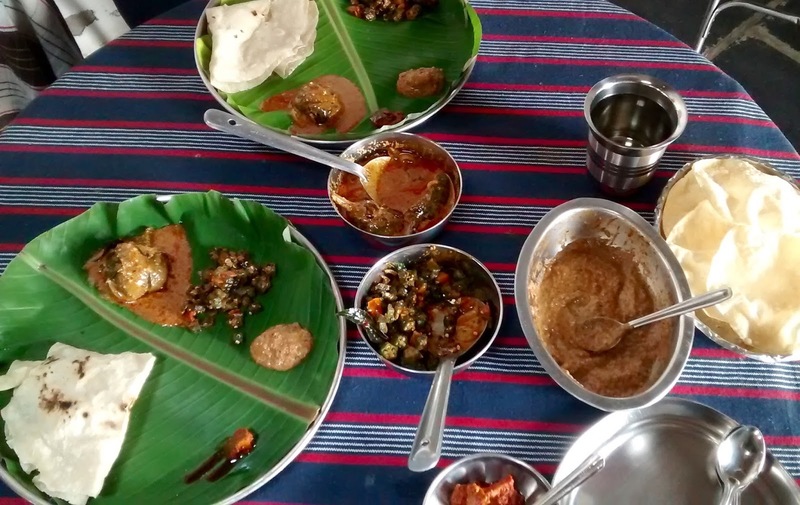 This lunch was arranged by our host at Uramma Heritage Homes, upon request. Yes ! If you are in Hampi, you’ve got to do this. It’s not even one bit as scary as it looks. We were quite apprehensive about it initially because of its small size and ‘fragile’ make, but the moment we sat inside, we realised it’s actually quite big and sturdy. 4. Learn the art of crochet with dried leaves of banana plant, water cress and corn. 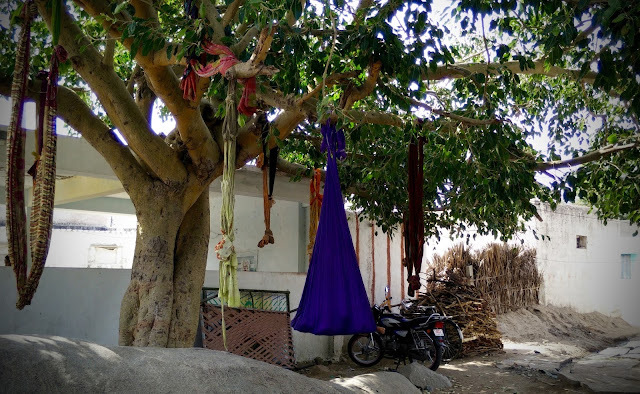 Visit community-driven handicraft workshop at Anegundi and learn how leaves of various locally grown plants turn into gorgeous bags, coasters, bins, boxes etc. This workshop employs upto 300 women from local villages and gives them a means of livelihood and independence. The women folk here very friendly, speak little bit of Hindi, happy to show you around and even customise certain items for you. 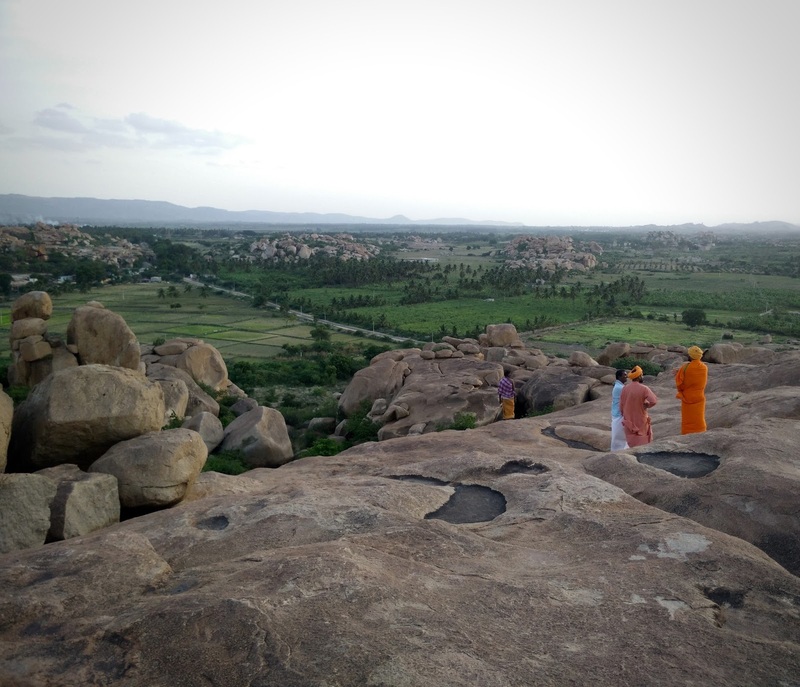 Imagine sitting on a smooth boulder at a clifftop, looking below at the majestic views of Hampi terrain with serpentine road network and patches of green vegetation, sun melting into shades of gold, orange and red opposite you, clean crisp wind flowing through your hair and hardly a soul in sight. That’s Malyavantha ! I am sure every regular to Hampi would have his or her own recommendation for ‘best sunset’ point. But for me, Malyavantha trumps. Its on the edge of tourist circuit, thereby attracting very few tourists and it can be reached by a vehicle, hence no huffing-puffing on way up! It’s located just behind the Malyavantha Ragunatha Temple- a beautifully raw and unpolished complex of ancient temple, and consists of big boulders conjoined together to form a cliff. I am told it’s much better than its more popular cousins Mathanga and Hemakuta. Uramma is a community driven set of boutique guesthouse and heritage homes located in Anegundi village. It’s eco-friendly and chic design blends in all basic creature comforts, and at prices starting as low as Rs. 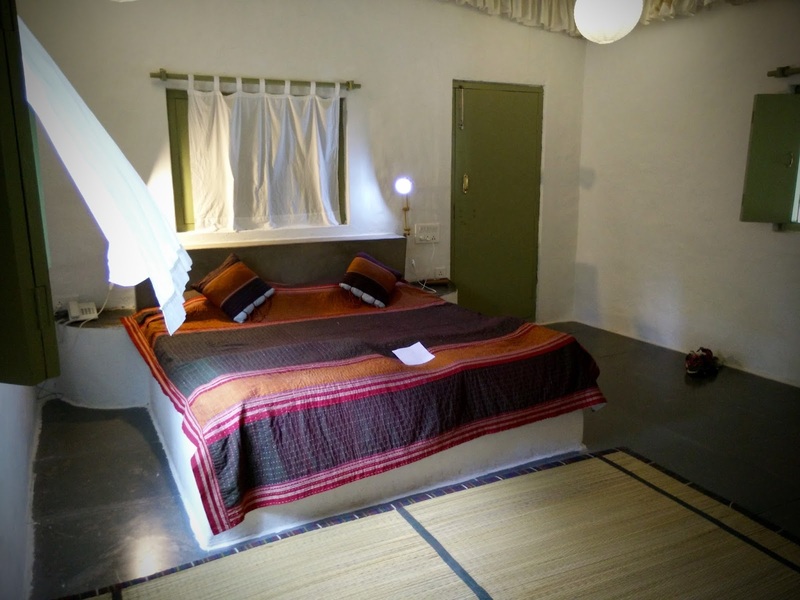 400/- for a double room in off-season, it’s a real treat ! It’s managed by a set of very friendly and trained staff from surrounding villages. Even the kitchen uses all local produce, including the bread and jam that they make in-house. Find my review of this property here. The food is delicious. Thanks for sharing. Have you visited Anjani Parvat to watch Sunrise? and then the beautiful Sanapur Lake during sunset? No Tushar. This was a very short trip !